WASHINGTON (AP) — Two members of President Donald Trump’s Cabinet suggested Wednesday that Canada and Mexico might escape new tariffs on steel and aluminum, a potential bargaining chip in North American trade talks that heeds the ‘surgical approach” advocated by House Speaker Paul Ryan. Treasury Secretary Steven Mnuchin said the administration was “definitely going to end up” with the across-the-board tariffs Trump is seeking — 25 percent on steel imports, 10 percent on aluminum. “But, again, there will be a mechanism where, to the extent that the president wants to give waivers, the president can do that,” Mnuchin told Fox Business. Business leaders expressed alarm about the potential economic fallout from the tariffs Trump is pursuing, with the president and CEO of the U.S. Chamber of Commerce raising the specter of a global trade war. That scenario, Tom Donohue said, would risk the economic momentum from the GOP tax cuts and Trump’s rollback of regulations. “We urge the administration to take this risk seriously,” he said, and opt against the tariffs. 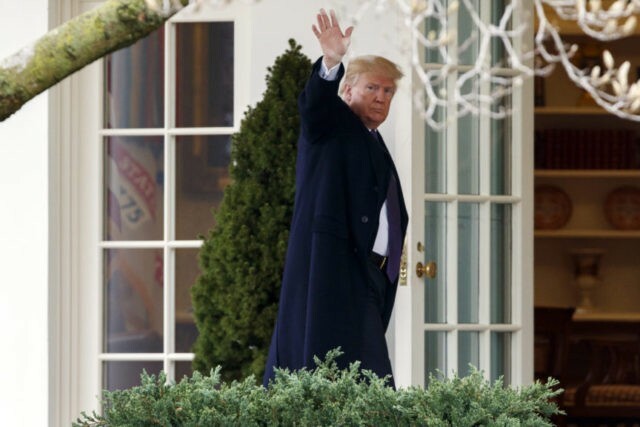 Trump has said they’re needed to preserve the American industries and protect national security, but he also has tried to use them as leverage in the current talks to revise the North American Free Trade Agreement, negotiated under President Bill Clinton. White House adviser Jared Kushner and staff from the State Department and National Security Council planned to meet Wednesday with Mexico’s president and foreign minister in Mexico City. Trump also signaled other trade actions could be in the works. In a new tweet, the president said the “U.S. is acting swiftly on Intellectual Property theft.” His trade representative is investigating whether China’s rules are “unreasonable or discriminatory” to American business. Findings from that review, and possible reflationary actions, are expected to be announced in the coming weeks. Congressional Republicans and industry groups, warning of the economic fallout, are pressing the president to narrow his plan, but he appears unmoved. “Trade wars aren’t so bad,” he said Tuesday, adding that the U.S. has long been “mistreated” in trade deals. Hours later, Trump economic adviser Gary Cohn, who has opposed the tariffs, announced his plans to depart the White House. Ryan, R-Wis., called for a “more surgical approach” that would help avert a trade war. Added Senate Majority Leader Mitch McConnell, R-Ky.: “We are urging caution,” McConnell said. Trump has been keenly aware of how the tariffs may play in a March 13 special House election in western Pennsylvania, part of the steel belt, White House officials have said. The president is headlining a Saturday rally in support of Rick Saccone, who is battling Democrat Conor Lamb in the Republican-leaning district. Internally, White House officials who oppose the tariffs have urged the administration to limit the countries that would be affected and to impose time limits. This would help the president say he delivered on his promise and still try to avoid possible negative consequences, said Stephen Moore, a former campaign adviser and now an economist with the conservative Heritage Foundation. Republicans in Congress and within Trump’s administration say industries and their workers who need steel and aluminum for their products would be hurt by Trump’s threatened tariffs. They say Americans will face higher costs for new cars, appliances and buildings if the president follows through on his threat and other nations retaliate. Associated Press writers Alan Fram, Kevin Freking, Martin Crutsinger and Josh Boak contributed to this report.